Having a genre fueled Twitter timeline has exposed me to many products in the stew. Admiring the hard work of Amandla Stenberg, a young actress, educator, and artist most known for her role as Rue in the first Hunger Games film, it was impossible to pass on the allure of Niobe, a comic book and title character she was intricate in further developing from a character first introduced in The Untamed: A Sinner's Prayer developed by Stranger Comics CEO Sebastian A. Jones. Niobe is a universe with a loaded mythology and heavy spirit. If my approach to fantasy seems "academic" for lack of a better term, it is because it reads to me like a fantastic, alternative cosmology that begs to be unpacked. I am in awe of writers who work tirelessly to create such an immensely popular genre. And it is unsurprising that Amandla had a hand in such detailed storytelling that she's publicly noted has roots in her own experiences as a young, biracial woman. Niobe Ayutami, the Half Elf, Half Wild Elf is fueled by her emotions. Running, encountering hostility seemingly from everyone she comes into contact with who is not pleased with her actions nor her identity. She's uncertain of her path yet assured in her convictions. Stenberg has spoken about the layers Niobe possesses as well, "Niobe is a powerful black female character but also complicated and has problems, and has things to overcome, and things to face. [She] is really strong but also emotional and weak at the same time." This is demonstrated very early in Issue 1 and is concrete in Issue 2, as Niobe also demonstrates compassion where there is little to none for her. 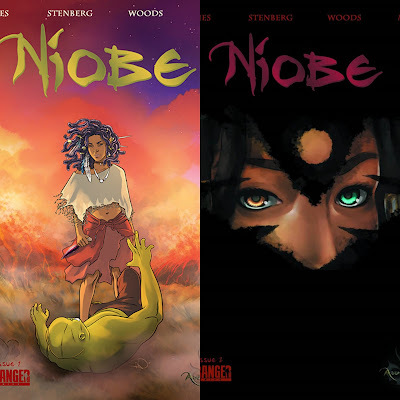 There's a strength in Niobe that is translated well into the importance of defining yourself against every person and force determined to take it away from you. Niobe is also a tool in showing how selfless behavior and empathy can generate a physical prowess that's underestimated. Additionally, it was attractive to see characters of color, Elf and otherwise, with Niobe's beauty being a very striking aesthetic along with Temshen, Niobe's at times adversary marked by contrasting body art and adornment. 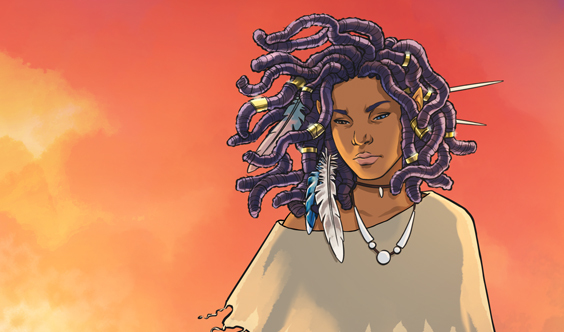 If you possess an investment in fantasy and newer comic properties, Niobe will surpass your expectations. I was taken away by the narrative's poetic prose and deeper meanings behind Niobe's budding journey. I hope to see plenty of Niobe cosplay. And soon. Purchase Issues 1 & 2 from Stranger Comics here.